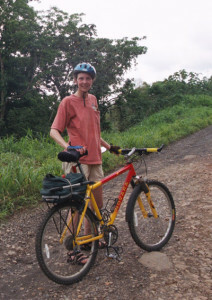 We took two bike touring trips to Costa Rica and rode over 1,000 miles on bikes without front shocks. We probably would have been on those bikes for the 1999 trip except that despite having had nearly all of their components replaced over their eight years of service they were starting to fall apart. We knew that front shocks would be nice because even the paved roads in Costa Rica are jolting and jarring with potholes and huge speed bump like buildups where past post holes have been repaired and re-repaired. We didn’t know exactly how nice the shocks would be until we tried them. Now we would never go back! We would like to thank the kind folks at Answer for designing and building their Manitou shocks to take the beating we gave them, while completely neglecting their maintenance, and always bouncing back. They even worked under water. We rode off the back side of Mirravalles volcano in a rainstorm so intense that it was hard to breathe. The jeep trail we were on turned into a river, 6″ of muddy gritty water flowing in torrents and depressions that would submerge our hubs. We couldn’t see what was coming up but the shocks did their job and gave us steering control on the descent. Obviously, if you are planning on carrying panniers, a rear suspension proves problematic. We ended up using the same system we had for the first two trips: big thick gel saddle covers. As far as the rest of the bike goes, we have both been very happy with the performance reliability and durability of our Shimano components. We can’t say that they are better or worse than anything else because we have never tried anything else. We figure Shimano is good and everything is compatible if you stick with one brand so why ask for trouble. The only thing left is the frame, and our take on that is that it really doesn’t matter which brand you buy. The bike manufacturers and their exclusive dealers will talk ’til they’re blue in the face trying to convince you otherwise but face it, the frames are all well made and they all carry a lifetime warranty. The only important thing about the frame is that it is comfortable, that you feel good on it. I ride on an old fashioned Crome Molly while Sue chose aluminum. One advantage of the aluminum is that it won’t corrode as fast when you get that inevitable salt on it from riding near the ocean, but with either material you better wash it off as soon as possible.